With their line of sleek, sculptural mirrors, lighting, and furniture, Ben and Aja Blanc prove two creative heads are better than one. 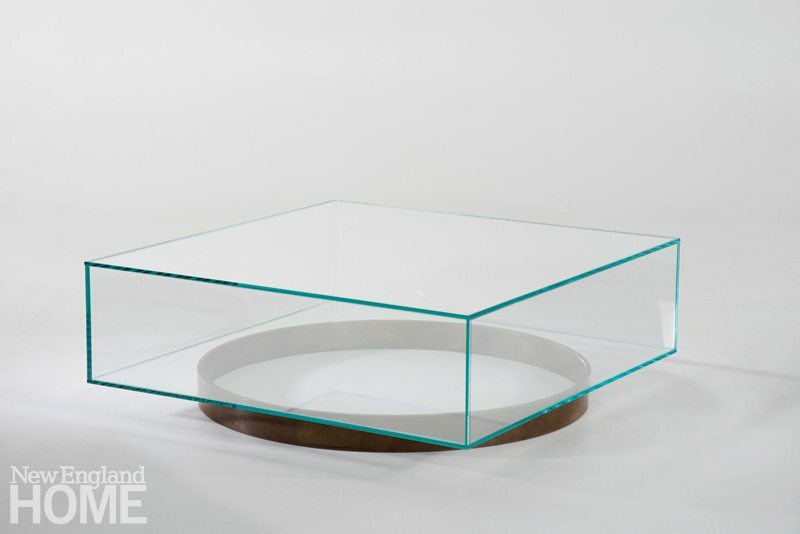 A ring of patinaed solid bronze supports the Atlas coffee table’s fully sealed glass enclosure. The Pillar side table, designed to highlight the beauty of the natural wood, is fabricated from lathe-turned solid white oak. The Apollo mirror, named for the Greek God of the Sun, comprises two half-circle mirrors joined by negative space and partnered with hand-spun, hand-painted silk fiber. 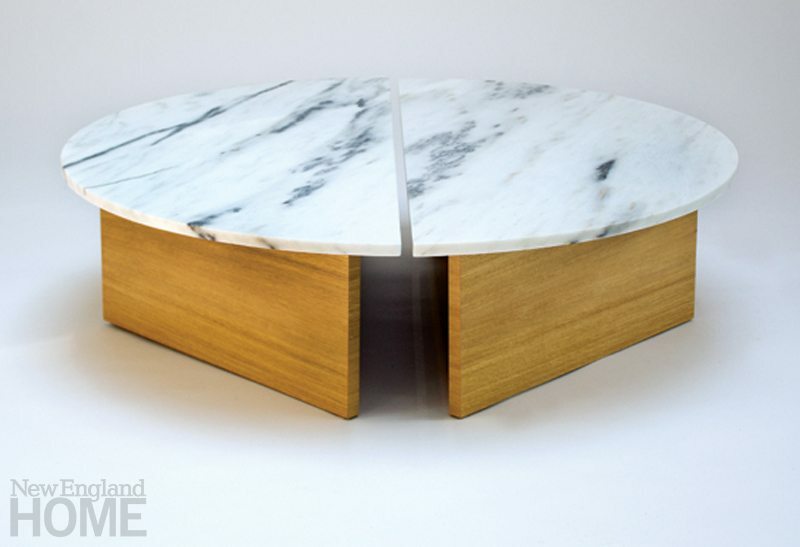 The two halves of the Half Moon coffee table are placed together to create dynamic spacing in the center of the table. The large-scale blackened steel Ellipse table. 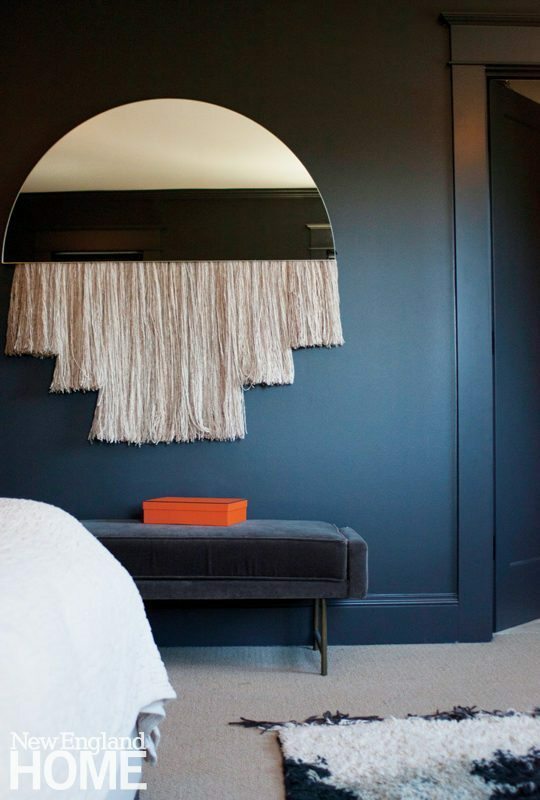 Hand-spun, hand-painted silk fiber hangs from the Half Moon mirror. The large-scale blackened steel Ellipse table. If you live and work together in a creative industry, inspiration can come when you least expect it. Maybe you’re on the back deck coloring with your two daughters when you realize you’ve just sketched an idea worth pursuing, or perhaps you’re grabbing drinks at a dimly lit bar on the West Side of Providence when you suddenly pull out pen and paper. So it goes for husband and wife Ben and Aja Blanc, who merged talents officially in early 2015 to form their eponymous Providence-based boutique design studio, producing furniture, lighting, and objects. The couple met in grad school at the Rhode Island School of Design, but pursued separate tracks after school while dating long-distance. She, a museum studies major, headed to the Yale University Art Gallery to work with their collection and teach. He, a furniture design major, stayed behind to start a design studio, freelancing on the side. Perhaps it’s no coincidence that much of the couple’s portfolio plays with “juxtaposition and partnering.” They tend to work with minimalist, monolithic forms and then add a level of warmth. Their Eos mirror, for example, not only contrasts the harder edges of a geometric form with the warmth of fiber, but also explores the relationship between the functional (mirror) and the nonfunctional (silk/mohair). With the rectangular Ida mirror, the Blancs probe partnering and light and reflection in a different way, by removing the mirroring on the bottom half. “It’s a subtle gesture that adds warmth and a horizon line, so now you’re aware of your environmental space,” says Aja. There’s also a modern, sculptural quality to many of their designs. With the statement-making Moon light, the image of the moon is lit from within and enclosed in glass. Hung from the ceiling or wall-mounted, it at once acts as light, sculpture, and image. Sourcing plays an important role in the process, too. The fiber they incorporate in their designs (a silk/wool/mohair blend) is hand-spun and hand-painted in Japan. The designers pride themselves on working with various manufacturers to achieve the best results; in fact, not one piece is solely made in house. The components and materials are shipped to their studio, where they construct the final pieces. And as for that piece Aja started sketching on the back deck with her little girls? It’s currently in the design phase, part of a new collection of fiber mirrors that will be released by the end of the year.